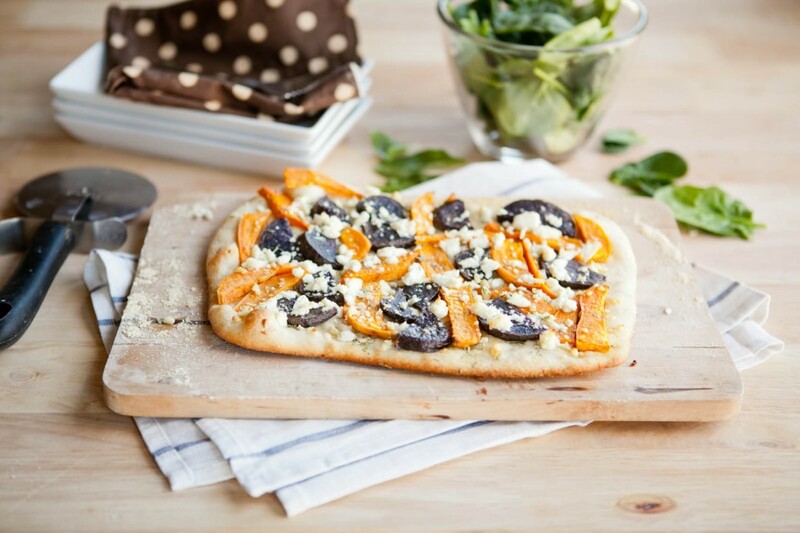 Sweet Potato and Feta Pizza | Naturally. I think we need to redefine pizza. All too often people think that pizza should have 2″ of cheese and another 2″ of meat layered on top of a big doughy crust. Don’t get me wrong, I live close to Chicago so I understand pizza. However, I think when making pizza at home, it’s okay to branch out from the tomato and cheese version everyone loves so much. I urge you, play with your pizza. I love having pizza parties where the dough and toppings are ready but everyone gets to make their own personal pizza.Even better, pizza dough freezes well and as long as you remember to pull it out a few hours before you want to use it, you’ve got an easy-peasy pizza night. In a bowl of a stand mixer, combine the water, yeast, and honey- stir with a wooden spoon until yeast is dissolved. Let sit until yeast begins to activate, 5-10 minutes. Once yeast is ready, toss in oil, salt, and 1 cup of flour. Turn your mixer on low with the dough hook on and let mix, scrapping down the sides as needed. From here on out, add 2-4 tablespoons of flour at a time, letting the dough mix for a bit until adding more flour. When the dough starts to come together, continue to let the mixer run for 1-2 minutes and adding more flour until your dough has pulled away from the sides of the mixer. The goal is to have a soft dough that still sticks to the bottom of the mixer but pulls away from the side. Once your dough has reached that consistency, continue to mix for 2-3 minutes more. Once there, remove from the mixer and place in a warm spot. Brush with oil and let rise for 1-2 hours (depending on how fast your dough rises). 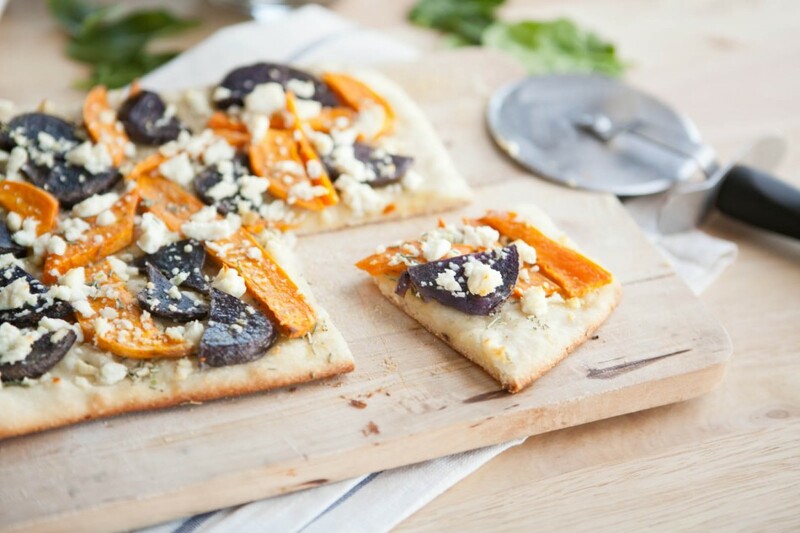 While dough is rising, peel sweet potato and cut both purple potatoes and sweet potatoes into 1/4″ slices. Toss with olive oil and pinch of salt. Place on a baking tray and roast for 25-30 minutes or until potatoes are tender and beginning to brown. Once your dough has double in size and sweet potatoes are done, turn up your oven to 500˚. Return to your dough and punch it down. Let rise for 20 more minutes. Melt butter in a small sauce pan over low heat and add garlic, cooking for 2-3 minutes or until garlic becomes fragrant. Stir in rosemary and let cook for 1 more minute. Roll the dough out onto a surface covered in cornmeal (I used a large wood cutting board put some of you may have a pizza peel.) Roll it out to the size of your pizza stone (not any bigger- you will have problems). Take half of the butter mixture and brush it only surface of the pizza. Next, top with sweet potatoes and purple potatoes, then brush with remaining butter/garlic mixture. Finally, sprinkle feta on top. Now, if you are talented enough, slide your pizza onto the stone while still in the oven. If you are a clutz like me, carefully remove the stone, slide the pizza on, and return to the oven rather quickly. Bake for 10 minutes, rotate (if your oven heats in the back like mine), and continue to cook until crust looks crisp and the feta is browning (usually another 2-5 minutes.) Remove pizza by placing it back on the cutting board and let cool slightly before cutting. ohhh drool!!! I much much prefer these types of pizza’s to heavy, greasy, overly cheesy pizze. And that right there looks divine! I need to find out where I can get some purple potatoes. Do they taste different? Not really… but you can also try and find purple sweet potatoes. I don’t see either often but I got these at whole foods last time I was there! I totally agree with you! I’ll take your version of piazza any day over tons of cheese and grease. Great combination too! Totally agree – and that’s almost always how I make pizza at home! I love experimenting. You’ve got me simultaneously craving this pizza and Chicago-style pizza. When I visited Italy, I was surprised to discover that our definition of pizza (loads of cheese and marinara sauce) is very different from traditional Italian pizza, which doesn’t always have cheese, or marinara sauce! I am in love with this pizza… I’m making pizza tonight with a dough that’s been sitting for about 9 hours now… It’s stickier than the usual and I’m nervous to see if it will turn out ok. These toppings will be for next time though because I already had something in mind. This is definitely something I will be making with the other half of my dough. Think blue cheese will work? Pizza dough isn’t as finicky as regular bread dough so hopefully it will turn out well! I think blue cheese would work well. It might be a bit stronger than the feta but I think it would taste good! My opinion on pizza tends to be – the least traditional, the better! 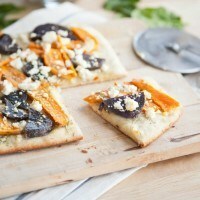 And the sweet potato feta combo sounds fabulous. I’ve done it in pasta before and a pizza is definitely the next logical step! Yum! This looks delicious. I love pizzas like this – more creative & full of flavour. I recently had an incredible pizza with roasted rosemary potatoes, ricotta and pistachios. Mmmm! So much better than your standard tomato & cheese!